Tech billionaire Patrick Soon-Shiong claims to have broken the $100 per kWh barrier with a new rechargeable battery. The breakthrough was not, however, achieved using the prolific lithium-ion battery that powers smartphones, laptops and electric vehicles across the whole world. Instead, Soon-Shiong’s company, NantEnergy, used lithium-ion’s lesser known cousin: the zinc-air battery. NantEnergy, formerly known as Fluidic Energy, has been working on the zinc-air battery six years. NantEnergy made the announcement during the One Planet Summit in New York. Zinc-air batteries are thought to be a more ethical, less-dangerous alternative to the more widespread lithium-ion battery. Lithium-ion batteries may be lauded for their high energy density, but they are also notorious for causing a host of problems. Lithium-ion cells can overheat easily and have been known to catch fire or explode. The materials that go into lithium-ion, particularly lithium and cobalt, have received criticism for unethical and polluting mining practices. By contrast, zinc-air batteries can do much of what lithium-ion can but without the danger of overheating—zinc-air batteries don’t even need an external cooling system. Since zinc-air batteries use regular air as the cathode—with zinc as the anode—manufacturing them doesn’t require as many rare or polluting materials. Rechargeable batteries that are truly safe and clean have long been hailed as the “Holy Grail” of battery tech. Previous contenders for the title include solid-state lithium designs, which are more stable than their electrolyte counterparts. Unfortunately, most of the solid-state batteries that have worked well in the lab prove to not be scalable for Tier 1 manufacturing. That is why the $100 per kWh barrier is so important. For large-scale manufacturing, a power storage solution must be capable of a certain energy output that is also below a certain cost. 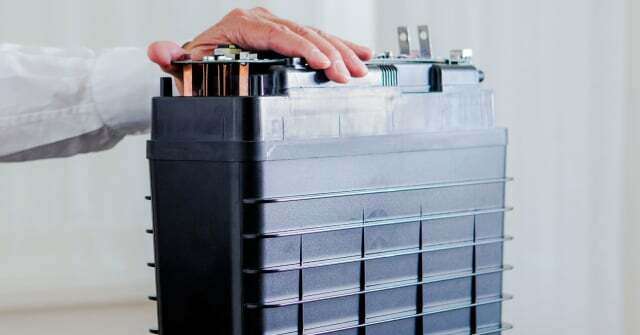 Currently, the only types of batteries that are in the $100 per kWh range are lead-acid batteries, according to Ramkumar Krishnan, NantEnergy CTO. Lithium-ion batteries on average manage a cost of around $300 to $500 per kWh. EV company Tesla has lithium-ion batteries that have gotten as low as $100 to $200 per kWh, but they have not yet achieved what NantEnergy has for zinc-air. Tesla CEO Elon Musk has previously stated that he expects to breach the $100 per kWh barrier later this year. By focusing on zinc-air, NantEnergy is delivering more than an unprecedentedly low manufacturing cost. The safety and low environmental impact of the zinc-air battery is no small factor in the renewable energy race. If NantEnergy delivers on its promises, it will be no small achievement. What sort of performance data NantEnergy will offer to validate its claims has yet to be seen. The company has been largely targeting power storage for solar plants as its primary market for the zinc-air battery. It has batteries deployed in over 3,000 “microgrid” systems across nine countries, mostly in Africa and Asia. It also has the batteries installed in 1,000 cell tower sites, many of which are in the U.S.
With the high output per cost that NantEnergy claims, there’s no reason the company won’t be able to expand in U.S. markets. NantEnergy intends to have factories in California manufacturing the batteries in 2019. The question is still whether the batteries will prove as durable as other products on the market. Lithium-ion batteries are known to last for thousands of cycles over periods as long as 10 years.